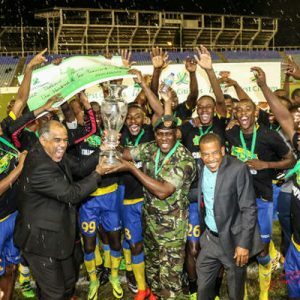 The Defence Force and Ma Pau Stars football clubs will contest the first meaningful trophy of the 2016/17 Pro League season after booking their places in the First Citizens Cup final in contrasting style yesterday evening at the Ato Boldon Stadium in Couva. 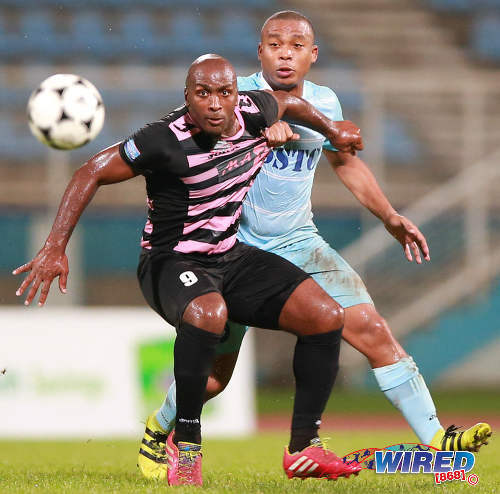 For Defence Force and, in particular, Devorn Jorsling, their semifinal outing was another happy encounter with Morvant Caledonia United. Jorsling, a former Caledonia AIA striker, scored all three goals for the Army/Coast Guard combination, as they gunned down the “Eastern Stallions” 3-0. 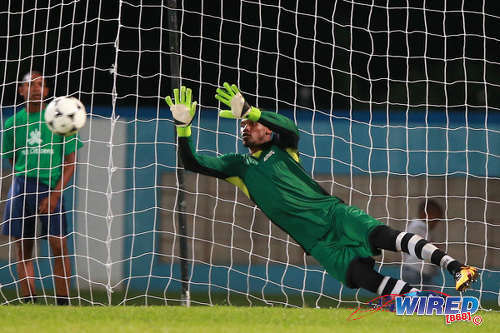 Photo: Ma Pau Stars goalkeeper Glenroy Samuel dives to deny a penalty from Police FC attacker Christon Thomas in the First Citizens Cup semifinal on 27 November 2016. While, in the second match of the Couva double header, Stars custodian Glenroy Samuel stole the spotlight with two saved penalties as the Sangre Grande-based outfit avenged a 5-1 loss to Police FC with a 3-2 win on kicks from the penalty mark—after a thrilling 3-3 tie in regulation time. It set the stage, for the first time in two years, for a final that features neither Central FC nor W Connection. 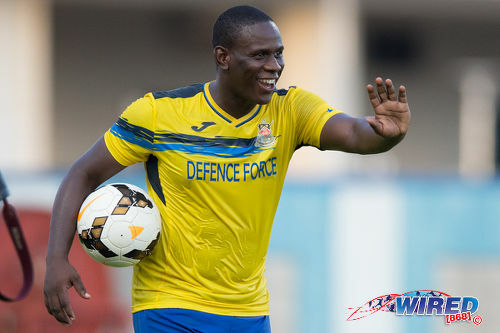 Defence Force players, who edged Connection for the last trophy of the 2015/16 season, the Digicel Pro Bowl, must have felt an air of expectation when they looked across the halfway lime and saw Morvant Caledonia. The two teams met six times in this calendar year before last night. Defence Force won four while the other two were drawn. Jorsling scored three. Yesterday, Jorsling matched his 2016 tally against Morvant Caledonia in a 22-minute burst with two goals coming with seconds of each other on either side of the halftime interval. The left-footed old fashioned centre forward beat opposing goalkeeper Marvin Phillip with a precise free kick on the stroke of halftime. 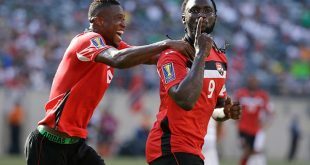 Then, just eight seconds after the break, got his double as he held off a retreating defender rolling his shot around the Soca Warriors custodian from a through pass. 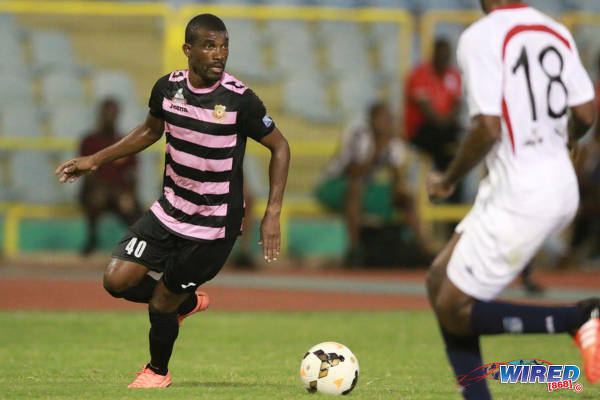 Photo: Defence Force striker Devorn Jorsling celebrates a strike against Morvant Caledonia United in the First Citizens Cup semifinal on 27 November 2016. His third came from the penalty spot in the 67th minute after Morvant Caledonia defender Seon Thomas was penalised for a handled ball in an effort to stop Defence Force playmaker Hashim Arcia. Remarkably, Jorsling has seven goals in his last two First Citizen Cup games and 10 in eight outings this season. The second semifinal was far less predictable. Stars were humiliated by Police in their first game of the season. But coach Ross Russell’s men recovered quickly and that sort of lopsided scoreline was never likely yesterday. The “Lawmen” celebrated first as Jibri McDavid hooked home from close quarters after Stars failed to clear a Christon Thomas corner kick in the 35th minute. Police struck again, just two minutes later, but it was the Stars who cheered this time. Former England Premier League forward Jason Scotland chipped a ball into the opposing area for teammate Jerrel Britto, only for Police left back Nequan Caruth to divert the ball away from its intended target with his arm and past his own goalkeeper, Adrian Foncette, in the process. Police mustered a third, three minutes into first half stoppage time—and this time at the right end—to head to the dressing room with a 2-1 lead, after utility player Elijah Belgrave scored with a thumping header off another Thomas corner kick. So much for semifinals being cagey, sterile affairs. And there was more of the same in the second half with Scotland and Belgrave generally leading the charge for either team. Samuel produced a fine one-handed save to deny a Keion Wilson header in the 50th minute and, two minutes later, Stars were level as Foncette made a mess of a Hayden Tinto effort and allowed Scotland a simple tap-in to tie scores at two-each. While Scotland’s touch and know-how looked too much for the Police backline, the Stars defence continued to look petrified of crosses. Samuel tipped over a Todd header in the 62nd minute and produced another flying block to stop Wilson in the 64th minute. And, in the 79th minute, Stars looked to have made the most of the reprieve again as Scotland ran on to a Kerry Baptiste pass and produced a clever dinked finish past Foncette for a 3-2 lead with just 11 minutes to go. Samuel could not stop everything, though, and no points for guessing where Police’s equaliser came from. 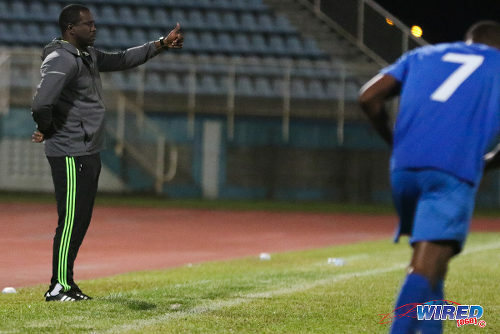 Photo: Police FC coach Richard Hood gestures from the sidelines during 2015/16 Pro League action against San Juan Jabloteh. Kareem Freitas delivered the cross this time and Belgrave, who played in an attacking midfield role, muscled past Stars full back Carlos Edwards to finish with another emphatic header. Baptiste might have finished the contest in stoppage time, after a clever wall pass from Scotland, but could not get his shot past Foncette. And referee Rashby McFee signalled for penalties. Foncette saved from Tinto while Stars midfielder Neil Mitchell hit overbar. But Samuel denied Thomas and Belgrave and Ryan clipped the top of the bar, as Stars snatched a 3-2 result after successful conversions from Baptiste, Edwards and Keryn Navarro. 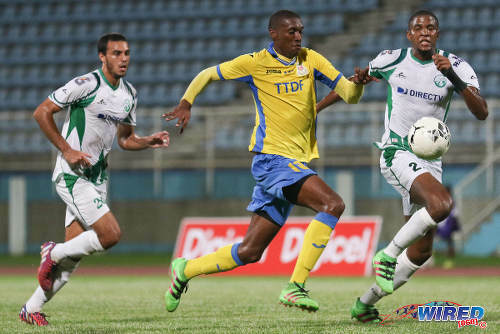 It was Stars’ third straight triumph from the penalty spot after similar wins over San Juan Jabloteh and W Connection in the earlier rounds. If that is a lottery, Samuel has found a way to rig the system. Ma Pau Stars (4-2-3-1): 22.Glenroy Samuel (GK); 25.Keryn Navarro, 5.Taryk Sampson, 19.Glenton Wolfe, 2.Carlos Edwards; 11.Elton John, 21.Neil Mitchell (6.Neil Mitchell 54); 7.Kerry Daniel, 10.Jerrel Britto (12.Sayid Freitas 90), 17.Hayden Tinto; 9.Jason Scotland (4.Kerry Baptiste 65). Unused substitutes: 1.Shane Mattis (GK), 8.Adrian Noel, 16.Kereem Eastman, 20.Quincy Charles. Police FC (4-2-3-1): 18.Adrian Foncette (GK); 6.Jibri McDavid, 3.Ryan O’Neil, 17.Dexter Alleyne, 38.Nequan Caruth; 25.Kenaz Williams (14.Kaaron Foster 80), 21.Todd Ryan (captain); 10.Kareem Freitas, 19.Christon Thomas, 20.Elijah Belgrave; 16.Keion Wilson (23.Micah Lewis 75). Unused substitutes: 22.Theon Browne (GK), 2.Akeil Thomas, 12.Kadeem Riley, 13.Dillon Kirton, 39.Joshua Leach. Photo: Defence Force attacker Hashim Arcia (centre) runs at W Connection defender Jelani Peters during the Digicel Pro Bowl final at the Ato Boldon Stadium on 27 May 2016. *—Stars won 3-2 on kicks from the penalty mark. Ma Pau Stars vs Defence Force, 8pm, Hasely Crawford Stadium. Previous Is T&T’s failure to provide proper school facilities for all a human rights violation? hahahaha I never knew that my other prolific goal scorer was also left footed to eh Devon Cool Droggy Jorsling and the new Soca Worries Coach really need to give you a call up eh……BOOM. Yuh din see how he bumped into the man deliberately? thanks Lasana……. referees train just hard as the footballers. we have video session on a fouls, handle ball, reckless challenges etc….. so it was more or less a straightforward call….. Yes Kirwin. The photo shows the defender was essentially hugging the ball inside the box. So it was the right call. It looked harsh on first glance but from a photo of the incident. I’d say well done Gyasi.